In 2009, Little People of America (LPA), the American organisation supporting people with dwarfism and their families, declared that October would be the National Dwarfism Awareness Month. In establishing an annual Dwarfism Awareness Month, LPA hopes to raise positive awareness of dwarfism; addressing common misconceptions and increasing opportunities for people with dwarfism around the country. “People with dwarfism are no different than any other person. We may just need a well-placed stool. Our members are children, college students, business professionals, doctors, engineers, mechanics, artists and teachers. We can do anything an average-height person can do,” says Lois Lamb, LPA President and a person with dwarfism. The RGA, a UK charity supporting people with dwarfism and their families, is delighted to be able to join LPA in their mission for Dwarfism Awareness Month. We want to work with all organisations supporting people with dwarfism and their families to make October an International Dwarfism Awareness Month. To be proactive in encouraging public awareness of positive stories of the dwarfism community, the RGA are delighted to be able to support a project for the whole community. 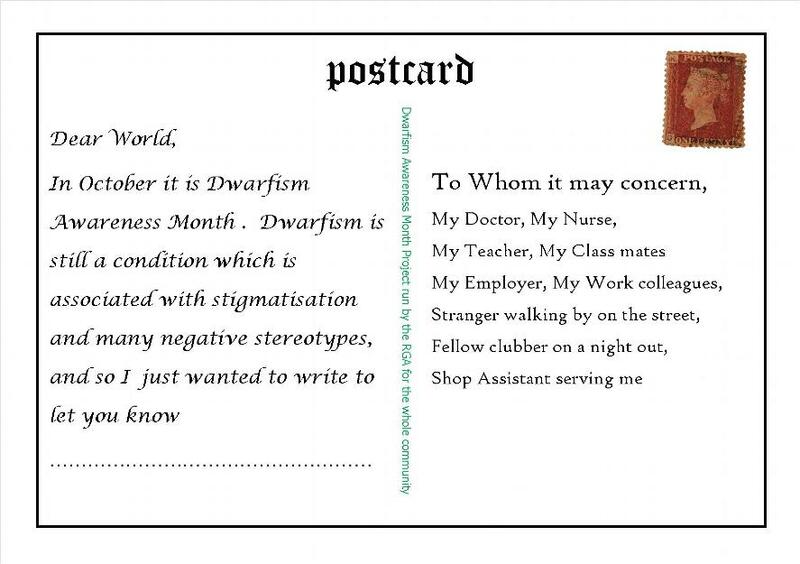 Send a message - give a fact, information, or experience that you want people to know about dwarfism. If possible, please send a video recording or an audio recording of you speaking your message aloud. Send a picture - of you with your family, on holiday, enjoying one of your hobbies or at work. Tell us about one of your achievements - your GCSE's, A-Levels, Degree, Employee of the Month Award, competing with your Chess Club, Badminton or Squash Club, Golf Club, etc. If you send in a photo of your achievement, then please also provide details of the occasion along with the photo. The RGA will combine all these facts, experiences, videos, recordings and photos together and produce a short video celebrating the diversity of the short stature community and showing that people with dwarfism are no different from other people. This video can then be distributed to schools, colleges, universities, doctors, hospitals and the media, to raise positive awareness of dwarfism.